Room 1: double bed, wardrobe, table, chairs, bath (Du./ WT./ WC), sunny. Westbalk. 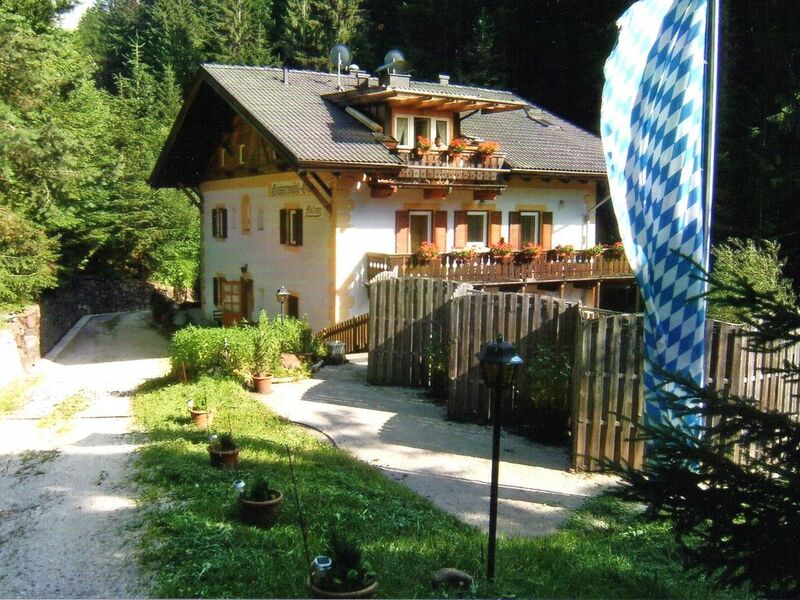 Our quiet house is located at 1000 m above sea level about 15 km southeast of Bolzano on Eggentaler Bergbach and offers budget holiday apartment rooms for two people with bathroom and balcony. The cozy lounge with kitchen and oven in the terraced floor, is very often used by groups for convivial evenings. It is located in Eggental below Eggen, surrounded by forest, meadow, water on the rushing mountain stream, just a few minutes drive from the Ski Center Latemar / Obereggen. All rooms with kitchenette, satellite TV, bathroom, central heating are equipped with frz. Double bed, extra bed, table, two chairs, wardrobe and balcony table with two chairs. The bathroom is furnished with shower, toilet and sink. The mini kitchens have two hot plates, fridge, sink and glass cabinet with crockery / cutlery for up to three people. The kitchen in the basement is intended for friends of several apartments for communal cooking pleasure. The sun terraces, which can also be reached from the ground floor lounges, as well as the natural meadow and the sun island in the creek, are available to the guests of the apartments for a free, comfortable stay. -Kitchen and lounge in the basement with complete facilities - for friendly people from several apartments - with exit to the large, comfortable terrace. Looking south and west into the green, towards brook and forest, in the midday and afternoon sun. Room 1 in the entrance floor with space-saving Murphy bed. View from the balcony to the west to the terrace in the afternoon sun. La camera è piccola ma carina con una bel balcone,la doccia è spaziosa. I proprietari sono super gentili e ospitali,al nostro arrivo ci hanno preparato dolci e cocktail di benvenuto. Consigliato! Stanza molto piccola al piano terra dell'abitazione, "letto" salvaspazio scomodo e bagno essenziale. Internet non c'è e il cellulare in stanza non prende. Dentro il mobile ci sono degli utensili per la cucina, ma non c'è la possibilità di usufruire del piano cottura. Non c'è la tv. Il proprietario non parla l'italiano. In paese non sono presenti molti negozi o locali, né possibilità di attività ricreative. Caparra bloccata per più di 20 giorni dopo la fine della vacanza. Gl'altri appartamenti sono invece forniti di angolo cottura e televisione, ma quella tedesca. 15 minutes from the motorway exit Bozen-Nord / Eggental at Birchabruck / Eggen. Conservatory, nature around the house. Obereggen, Rosengarten, Latemar, Weisshorn, Schwarzhorn, Bletterbachschlucht inn. 15 minutes.